She got the idea from the book Vintage Fabric Style, which I got at Jo-ann's using my 40% off coupon (I love those things!). And last I'm almost finished with the stitching part of my strawberry. 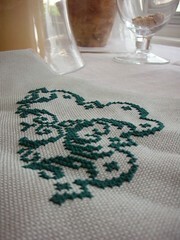 It's on 20 ct. linen over two, so it's going pretty fast. You and your mom do great work! 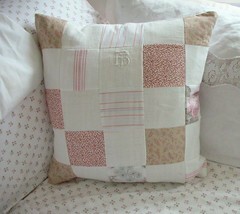 Her patchwork pillow is beautiful, and gives me such ideas...it's online to ebay for some cutters now! LOL! Thanks for the name of the book--I'll be looking for it. 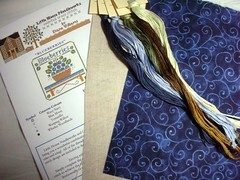 The LHN Blueberries will stitch up into a cute piece. Love the pillow your Mom made. Great patchwork pillow! I'm starting a sewing class this week. Wish me luck! Love the pillow your mom made. The kit is so cute too :-). BTW, like the new look of your blog too. Your mom's patchwork pillow is too cute! I'm expecting an order from Mary Kathryn any day which will include blueberries! 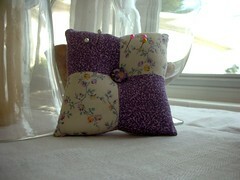 Love the pillow your mom made, you should dabble in quilting it is fun! I love the LHN Blueberries and the Strawberry class! The strawberry is coming out cute....wish that chart was available to the public! Wowza - I still want your stash shopping budget! 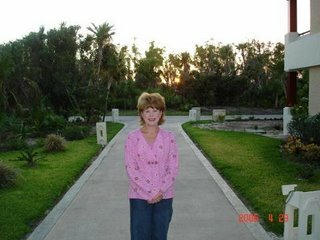 Yikes, I can't buy anything, so I should stay away from this blog for a while!! Looks like you had some fun mail stash come in! And I can't wait to see how you finish your strawberry. I love stitching accessories like this. Ooh some scrummy stash there! What a gorgeous pillow your mom made. That is just so pretty. Is the LHN blueberries a new one? I haven’t seen that one yet! Must add it to list of things I want. :D The blue fabric for finishing it is gorgeous! I love all of the things you have on here, the pillows are adorable.